Guinea Fowl Jasper is a lively stone that helps to calm the mind while staving off the urge to indulge in flights of fancy. 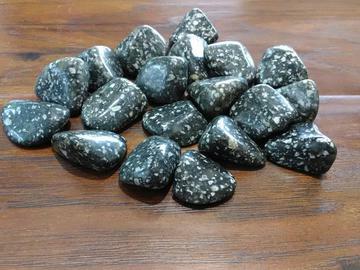 It is a great stone for those who want to play to their base-logic and discover greater, inner determination. There is a primal energy that accompanies this stone that helps you to identify with the primal forces of life from within. Working with this stone helps to alleviate stressful energy and as part of a grid can act as a beacon to your logical mind and crown chakra together. Guinea Fowl Jasper is a stone of sincerity, truth and loyalty.